Mr. John M. Thompson is the retired Executive Vice-Chair of the IBM Corporation, where he had the responsibility for worldwide technology, manufacturing, and business strategy. 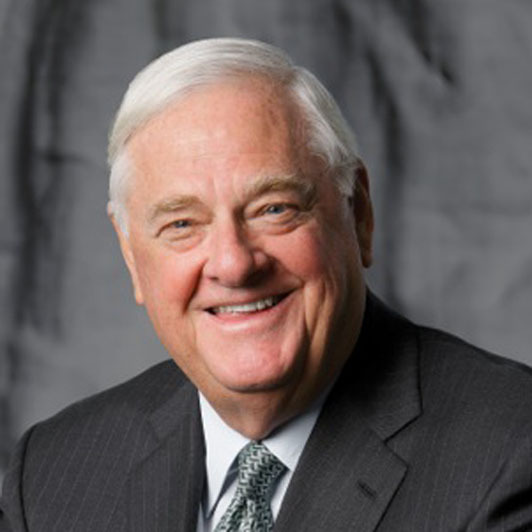 He also recently retired as the non-executive Chairman of TD Bank Ltd.
Mr. Thompson began his IBM career in Canada as a systems engineer in 1966. He held a variety of management jobs before being elected Chief Executive Officer of IBM Canada in 1986. In 1991, he moved to the United States, charged with developing IBM’s strategy for entering the global services business. Subsequently, Mr. Thompson ran IBM’s worldwide computer hardware and software businesses before being elected Executive Vice Chairman and to the IBM Board of Directors. Mr. Thompson is a graduate of Western University with a degree in Engineering Science. He also completed executive management programs at Western’s Ivey School of Business and the Kellogg Graduate School of Business at Northwestern University. Thompson was awarded Honorary Doctorate of Laws degrees at the University of Western Ontario in 1994 and Wilfred Laurier University in 2013. He is a Fellow of the Corporate Directors and the Canadian Academy of Engineering. Mr. Thompson also held recent directorships at the Thomson Reuters Corporation and the Supervisory Board of Royal Philips N.V., where he was Vice-Chairman. He also served on the Board of Trustees for the Hospital for Sick Children and as Chancellor of the University of Western Ontario. He currently serves on the boards or as an advisors to a number of Canadian and American venture capital organizations. Mr. Thompson is a previous director of the Conference Board of Canada and the Business Council of Canada (BCNI). He served on past Premier of Ontario’s Councils for education reform, human resources reform and industrial policy, as well as the Council of Canadian Academies’ Expert Panel on Innovation and Business Strategy in Canada.